ICI - The IMF on Asset Management: Which Herd to Follow? As we noted in a previous ICI Viewpoints, however, the IMF’s chapter on the asset management industry is marred by errors, inconsistencies, and misinterpretations, which undermine the chapter’s validity. These problems evince the IMF’s lack of institutional knowledge regarding regulated funds. In our latest entry, we discussed data errors around redemption fees. Today we’ll look at inconsistencies related to the IMF’s treatment of “herding” by funds. Herding: All Headed in the Same Direction? “Herding,” as commonly discussed in the literature, is “correlated trading,” defined as a group of investors tending to trade the same securities in the same direction (buying or selling) as their peers. The notion that herding occurs among regulated funds is a standard argument among those who think funds or managers could threaten financial stability. Their thesis: funds or investors “reaching for yield” will “herd” into particular asset classes or securities, then panic and “run” when prospects for that investment change, triggering “fire sales” that spread financial contagion to other investors and institutions. Put simply, according to the IMF, “herding” by regulated funds is a problem and is getting worse. Not so fast. Herding conjures up images of investors and funds behaving like lemmings. But the academic literature is mixed on what herding means. For example, the IMF bases its measure of herding on the methodology established by Lakonishok, Shleifer, and Vishny (1992) in a paper titled, “The Impact of Institutional Trading on Stock Prices.” The authors note that one reason investors may herd is because they tend to react to new information in the same manner. If so, as the authors note, those investors are “making the market more efficient by speeding up the adjustment of prices to new fundamentals.” Alternatively, they note that investors might herd if they seek to “counter the same irrational moves in individual investor sentiment, which would have a stabilizing effect.” Thus, views differ even among academic economists as to whether herding is a problem. Does the IMF Round Up the Evidence? What about the IMF’s argument that herding is high and on the rise? The IMF’s own evidence is in fact inconsistent and puzzling. 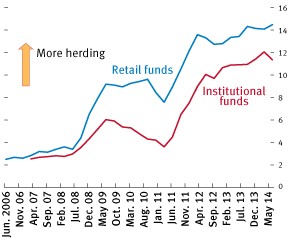 In the April 2015 GFSR, the IMF presented evidence that herding has increased among U.S. mutual funds (see the left panel of Figure 3.13, reproduced below). 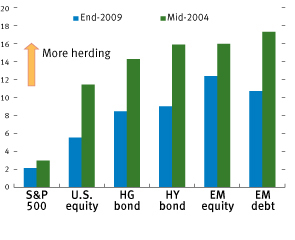 This chart indicates that “herding” increased across a range of securities types from late 2009 to mid-2014—notably for emerging market (EM) debt and EM equity. This seems to support the IMF’s position that herding is on the rise among regulated funds, in several sectors. Source: IMF staff estimates. Additional data: Calculated based on data from the survivor-bias-free U.S. mutual fund database ©2014 Center for Research in Security Prices (CRSP®), The University of Chicago Booth School of Business. Note: EM = emerging markets; HG = high grade; HY = high yield. The herding measure is that proposed by Lakonishok, Shleifer, and Vishny (1992). It assesses the strength of correlated trading among mutual funds investing in each security, controlling for their overall trade trends (see Box 2.5 of April 2014 Global Financial Stability Report). Note that the market as a whole cannot trade in the same direction, since at any given time there must be a buyer for each seller. The measure is 0 when there is no sign of herding among mutual funds. It is calculated every quarter, looking at the fund-level activity in each security, and then averaged across securities. The measure is computed when there are at least five funds that changed the holdings of a security in each quarter for each security. The CRSP database contains security-by-security holdings of all U.S.-domiciled open-end mutual funds, covering more than 750,000 securities. To make the analysis computationally feasible, this chapter works with subsamples of securities that are randomly selected. Except for the S&P 500 sample, the herding measure is calculated with 50,000 randomly selected securities for each of the subgroups. In panel 1, the difference in herding across neighbor categories is statistically significant at the 5 percent confidence level, except for the case of EM debt versus EM equity, and HY bond versus HG bond. The difference in herding by fund type (panel 2) is significant at the 1 percent confidence level. But the April 2015 GFSR isn’t the IMF’s first attempt to measure herding. One year earlier, the April 2014 GFSR also reported measures for herding for EM equity and debt funds. That picture, however, looks quite different (see IMF Figure 2.7, reproduced below). Sources: EPFR Global; and IMF staff estimates. Note: EM = emerging market. The herding measure is that proposed by Lakonishok, Shleifer, and Vishny (1992). It assesses the strength of correlated trading among mutual funds investing in EMs, controlling for their overall trade trends (see Box 2.5). The measure is 0 when there is no sign of herding. It is calculated every month, looking at the fund-level activity in each country, and then averaged across EMs. The measure is computed when there are at least six funds in a month. Notice that the levels of herding in the 2014 chart are considerably lower than in the April 2015 chart and are not particularly high. For example, the measure for EM bonds looks like it averages about 3.5 percent. To put this level in context, it is only slightly higher than the 2.7 percent herding figure that Lakonishok, Shleifer, and Vishny report for pension funds, which they apparently view as quite low (the authors at one point say, “perhaps we should not be surprised by how low this number is.”). A quick comparison of the data for late 2009, which are reported on both charts, illustrates the difference. We can read off the April 2014 chart that the IMF reported a herding measure for EM bonds of less than 4 percent from September 2009 to July 2010. In the April 2015 chart, however, the measure given for the same point in time (“End-2009”) is more than 10 percent—two and a half times greater. For EM equity, the measures for the end of 2009 more than doubled—from less than 6 percent to more than 12 percent—from the April 2014 chart to the April 2015 version. It’s also unclear from the 2014 GFSR that herding is trending upward. With respect to EM bond funds, there simply is no trend. The figure has bounced around in the past 10 years, and apparently increased in 2012, but only to about 4 percent, and has since declined. 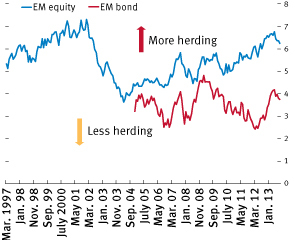 The IMF’s herding measure for EM equity increased since 2003, but that may simply be a rebound from what was perhaps a cyclical low in late 2003 to early 2004. By 2014, the level was about on par with what it had been in 2001–2002. That’s not the story presented in the IMF’s April 2015 Figure 3.13. Which of these charts should we believe? We don’t know—and the IMF doesn’t provide any guidance. If one reads the fine print in these two figures, it is apparent that the two charts use different data: the April 2015 chart is based on security-by-security data whereas the April 2014 figure is based on “fund-level” activity. But the IMF offers no explanation on why it changed from fund-level data to security-by-security data. In any case, knowing that the two charts use different data doesn’t provide any intuition for why there is such a sharp contrast between the two figures and which approach is more appropriate for thinking about systemic risk. What’s apparent, though, is that the earlier measures of herding presented in April 2014 (showing that herding was low and trendless) have been replaced by measures that better support the case for regulating funds (high, sharply rising measures) in April 2015. As our previous ICI Viewpoints post noted, these kinds of issues—arcane though they may seem—are very important in the debate over financial stability. For example, the multinational Financial Stability Board has already cited the IMF’s April 2014 GFSR in its Second Consultation, which proposes methodologies for identifying investment funds and asset managers as potential global systemically important financial institutions (G-SIFIs). This is significant for the more than 90 million Americans who invest in U.S. regulated stock and bond funds. Under U.S. law, designation of any U.S. stock or bond fund as systemically important would subject the fund to bank-like regulation, which in turn would raise costs for fund investors, reduce their returns, and hamper their ability to save for retirement. These investors deserve the most careful analysis based on a deep understanding of the data and institutional details of the fund industry. In the next piece in this series, we will take on the IMF’s claim that “retail funds” herd more than “institutional funds,” demonstrating that the IMF has misunderstood and mischaracterized the data on which it bases the right side of Figure 3.13, above. Sean Collins is senior director for financial and industry analysis.